Just recording another Lightning Maroon spawn; on Monday, March 30th, the pair put down Spawn #51. The nest didn’t look that great..the eggs were a lighter shade of orange, and the nest did not appear “tight”. I’m going to guess that this nest, like recent priors, is going to be a dud. It turned out that both the Nebula Percula pair and the Lightning X Lightning pair’s nests were due to hatch on the same night this past week…..6 days for the Lightnings, 8 days for the Percs. I scrambled like crazy to get everything ready, pulled the tile from the Lightnings (and set it up with 5 gallons of broodstock water) and set up a Vossen larval trap for the Percs. By morning…nothing. Nothing on either front. Later on in the day, all the Nebula percs had hatched…and promptly died…either smashed between the glass and the trap, or smashed on the screen of the trap (I may have had things turned up too high). I saw ONE Lightning offspring swimming in the tub. The next night, still nothing. Next morning, eggs still looked good…but nothing. I am kinda frustrated, but whatever. I have mounds of patience. 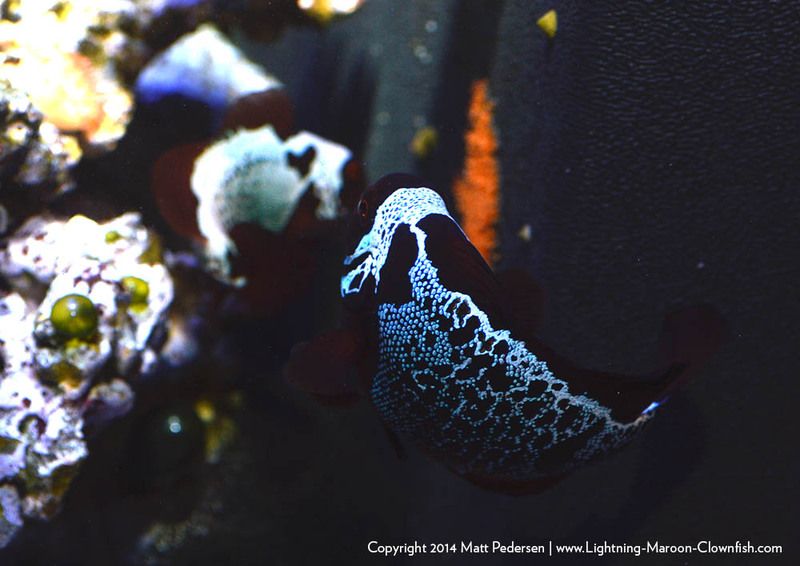 The Nebula Percs spawned again on 3/26/2015, and the Lightning X Lightning pair threw down their 9th spawn on Friday, March 27th. This is the 8th spawn from the F1 Lightning X Lightning pair, and unlike all prior small nests, this is a nice tight half dollar sized group; at least a few hundred eggs. And it’s the 2nd nest on a tile. FINALLY, we might be getting somewhere. The nest was spawned on the late evening of Wednesday, March 18th, 2015. In other news, Spawn #50 for the wild lightning pair hasn’t gone so well…most of the eggs are gone, presumed eaten. It was a much bigger nest..but looks like it’s still not working out right. I also received word on 3/18 that the Great Lakes Aquarium’s pair was sitting on a 6 day old nest. Additionally, Mike Doty’s pair spawned again! I wonder who else has fish spawning for them now? 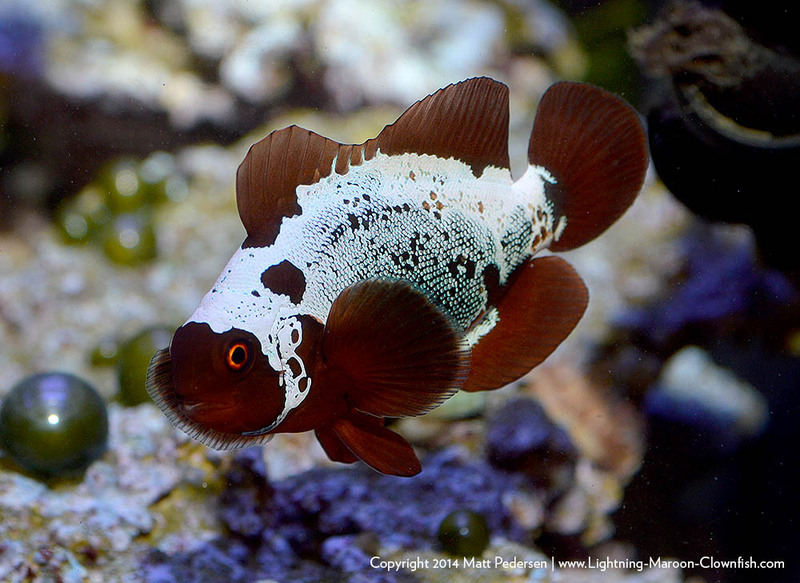 This is a spawn of note; on the evening of March 17th, 2015, the wild pair of PNG Lightning Maroon Clownfish and her PNG White Stripe mate put down their 50th spawn in captivity. It looks like a good one, so I think they might be back on track! On either March 1st or March 2nd, the wild Lightning Maroon and its mate spawned again. I found the nest tonight (I didn’t make it down into the fishroom on the 1st), just a smattering of eggs…probably less than 50. I’m guessing this was a “pre” spawn…or maybe they’ve been eating eggs. Not really sure, but not holding out hope yet. In the very week morning hours (eg. 2 AM) on 12-13-2014, I discovered spawn #47 from the wild caught pair. Obviously it was actually put down on Friday afternoon (12-12-14). Now that the fish are off the Chloroquin-laced food, it’ll be interesting to see if this clutch holds out or not. 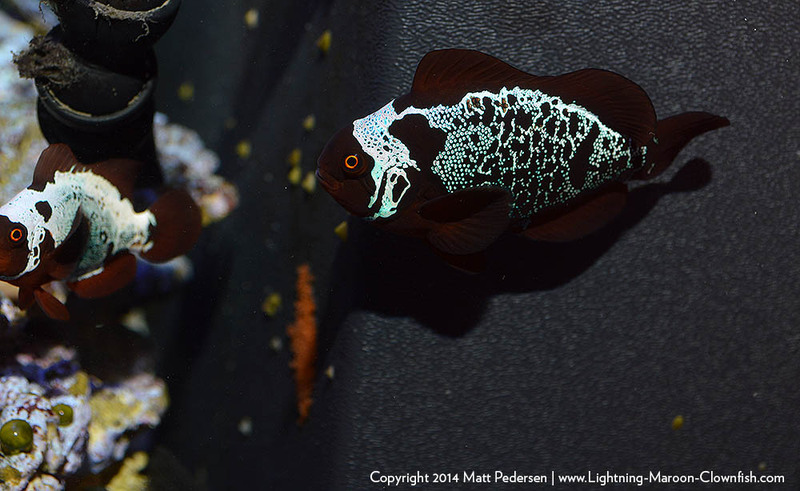 Just jotting down notes…Spawn #45 of the wild Lightning Maroon pair happened on the evening of 11-19-2014. Meanwhile, LxL (the F1 Lightning Pair) Spawn #5 was gone by the same day….they obviously didn’t like me tiling their entire tank. I need to go by more terra cotta flowerpots…maybe they’ll like that. So much going on and I’m NOT doing a proper job of tracking things. 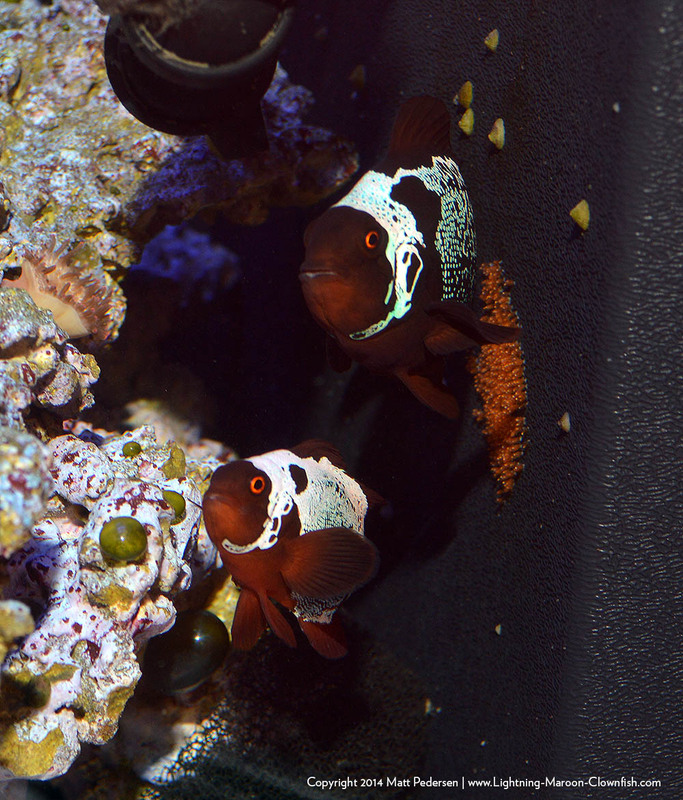 I should start with the unrelated F0 PNG White Stripe Maroon Clownfish pair…they spawned sometime last week, possibly Wednesday the 12th. I didn’t make much of a fuss about documentation of it because I knew I couldn’t deal with them at any rate; I can’t remember if it was very late Sunday night, or more likely Monday afternoon, when I found the last few eggs just sitting around in the tank. This pair, overall, is spawning quite infrequently. 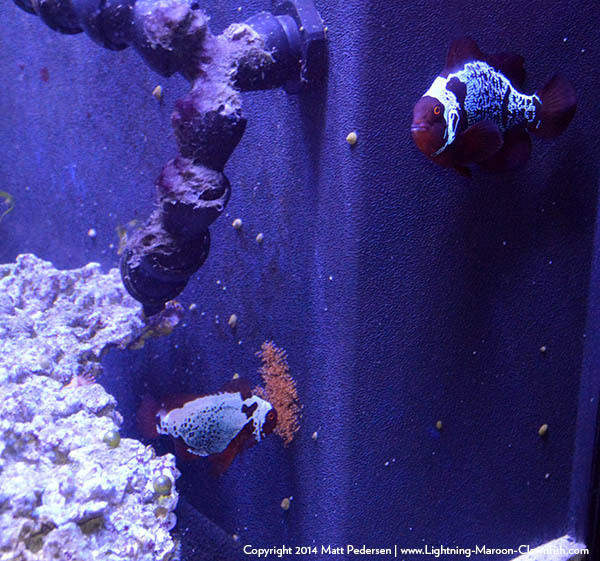 The Lightning Maroon Spawn, #44, never made it to hatching. Something happened, and the pair consumed the eggs. Could the Lightning foundation pair be winding down or did they just have a bad spawn? Their prior spawn produced a good amount of juveniles, which were undergoing settlement and on TDO A by last Thursday, which is when I drained them down to about a gallon, filled with clean new aged saltwater, and then turned them on to the larviculture system. LxL spawn #4 was one I was going to let go because I wasn’t in town (I was off speaking at the Milwaukee Aquarium Society’s “Fish Bowl” event), but in short, Mike Doty decided to play with harvesting the eggs. He took approximately 25% of the next out, using my little egg siphon, on Friday night (Nov. 14th). I got a text while in Milwaukee…there was a hatch..and a big one. Surprisingly, he simply did it in a 1 gallon olive jar with an air feed, sitting in a water bath with probably 75% new water. If I had done that, every last egg would have been dead. All credit where it’s due – Mike may well in fact rear Lightning X Lightning offspring before I do (they’re at HIS fishroom ) Mike further relayed that this was a split hatch, with more eggs present Saturday the 15th, but all gone by 4 AM Sunday morning. Yesterday, I caught wind that the F1 Lightning X Lightning pair was going to spawn again…the female was roving the tank with her ovipositor down. I did my best to FURTHER add tile to their tank, blocking their prior spawning spot off..which caused them to move to another side of the tank’s back wall, which I then blocked off with tile. They were still going through the motions of finding a spawning site when I turned the lights off after Midnight; technically they spawned in the overnight on the wee-early morning of 11-18-2014, but if I was to be thinking about these eggs properly, then normally they’d be a 11-17 spawn. Ultimately, they selected the ONLY section of black plastic background that I cannot get tile on (near the tank’s filter return). Either the nest was small, or they ate most of it, and I am considering foregoing working with it. I’m thinking that what this pair may really need is a clay pot…that might be the ticket here. So LxL Spawn #5 has been put down, but for now, probably will be left alone. BOOM – Lightning X Lightning Maroon Eggs are here! 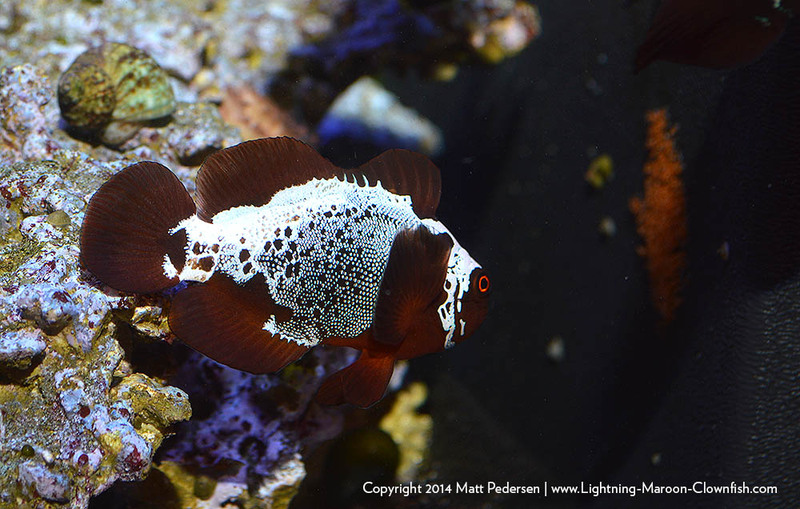 We are about to embark on the next exciting chapter of the Lightning Maroon Clownfish and genes. My hypothesis is that the Lightning gene is partially dominant or dominant. The offspring from this spawn, if successfully raised, will yield important answers that may shed new light on the genetics at play. Will we see something NEW come out of this? Well..I certainly hope so and it looks like I’ll get to name it! Yup, one of those quick little posts…9-29-2014, Lightning Maroon Spawn #41 was put down…and we’re back on the “slanted” tile instead of the vertical one. 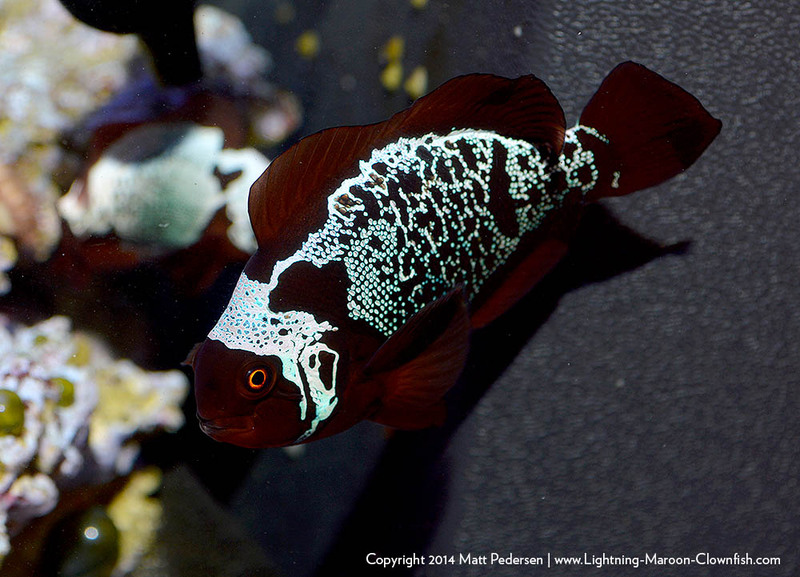 And alongside, the loaner pair of A. melanopus from Mike Doty also spawned on 9-29 as well…time to get me some MBI points!